Learn about the different reports in Kashoo, Income Statement, Unpaid Invoices and Bills and more. You can get access to your financial reports from the Reports section. This report will show you how much money your business has made within a certain period of time. You will see your income, minus your expenses, which will result in your net income. You have the following options to choose from when viewing your report. Choose your report format: You can choose from the standard date ranges - like This Year, Last Year, This Year vs Last Year - or select the Custom Date Range option to specify your own date range. As Of: This selects the date you want to report from. So for example, if you want a report for the whole of 2014, you would select This Year for the Choose your report format field and then December 31, 2014 for the As Of date field. 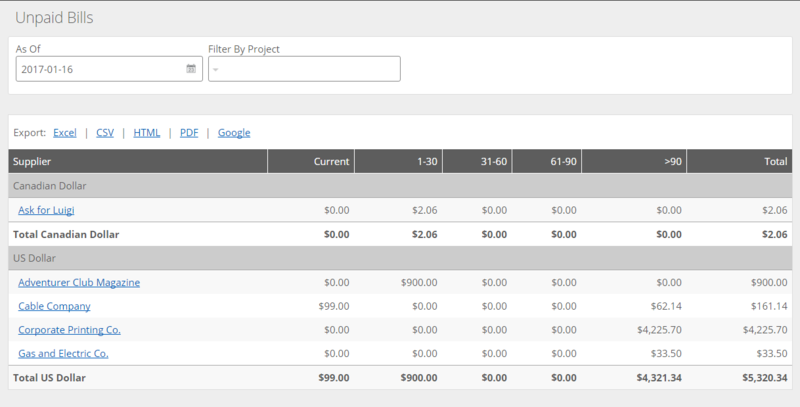 Filter by Project: If you have enabled Project Tracking on your Business Profile page and you're tracking income and expenses by Project, the Filter by Project option will be available. 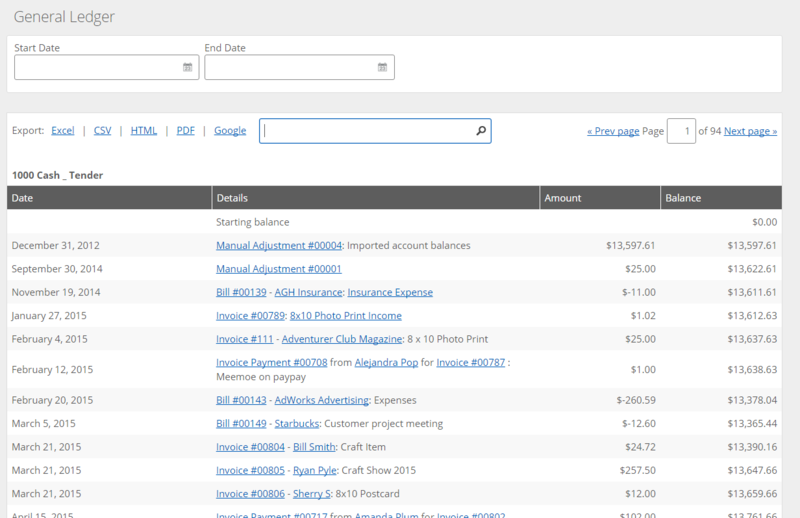 Select a specific Project to see income and expenses for that Project only. Start Date and End Date: If you chose Custom Date Range for the Choose your report format field, you will have the option of choosing a start and end date for the report you would like to see. - Account: This shows all the income and expense accounts. By default, this is how your profit and loss is arranged by. - Client or Supplier: This shows your profit and loss sorted by the customers you have made income from and the vendors you have incurred expenses with. - Item: If you have set up and use items, this shows you how many items you have sold and purchased, including the total quantity and dollar value. - Referral: When setting up your customers and vendors, you have the option to fill out a referral field. If you used that field, the report would show your income and expenses sorted by it. 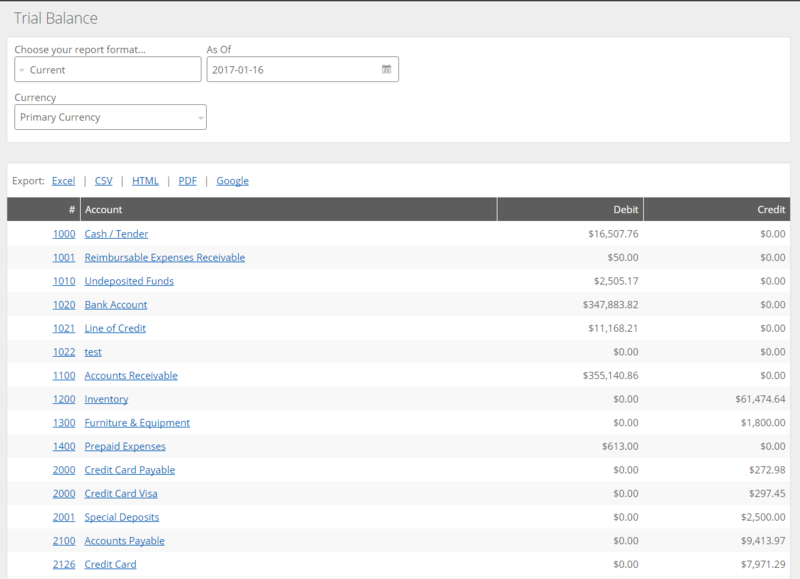 - Focus: You can focus your report by all accounts (the default blank field), income accounts, or expense accounts. This report will show you the balances of your asset, liability, and equity accounts at a point in time. Choose your report format: You can choose from the following time periods: Current, Last Year, Last Year vs Current, Last 3 Quarters vs Current, Prior 5 months vs Current. As Of: This selects the date you want to report on. So if you want to know your balances as of July 1, 2014, you would select Current from Choose your report format field and July 1, 2014 for the As Of date field. 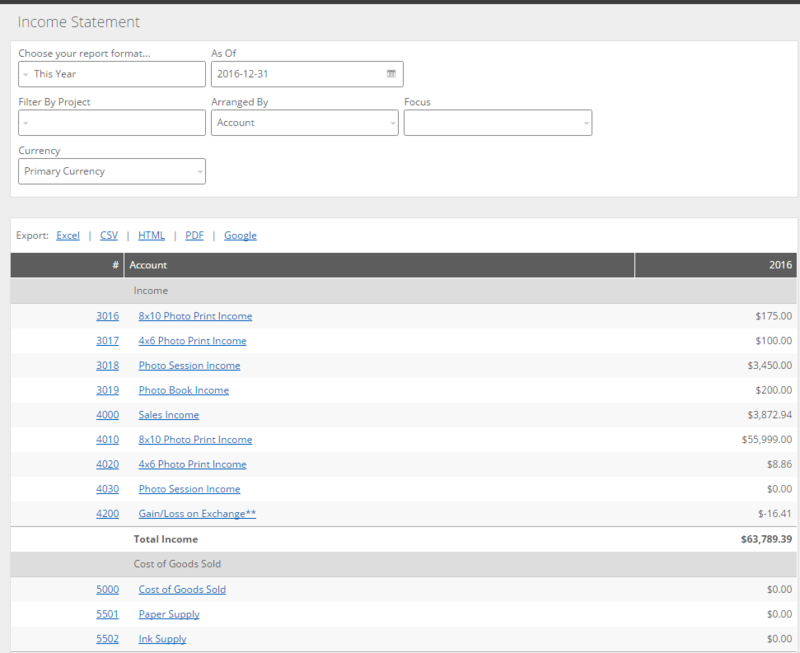 Format: You can display your balance sheet in a detailed or summary view. 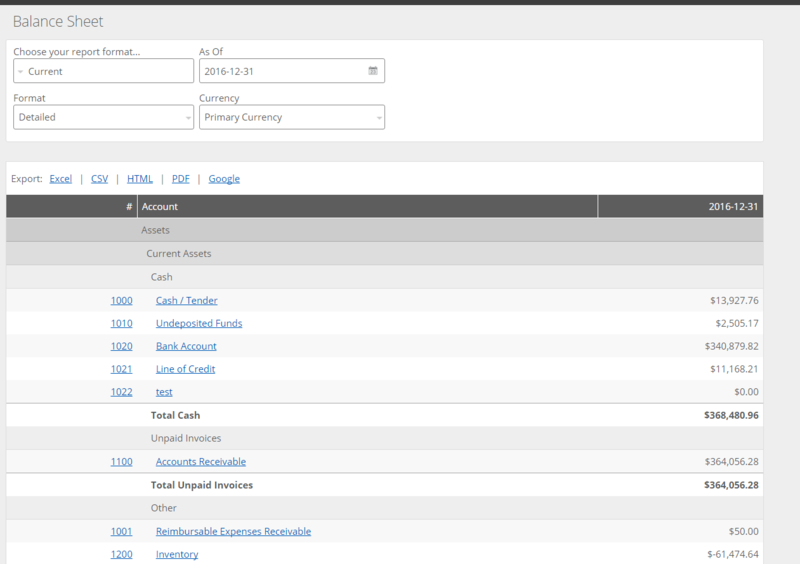 - Detailed: This view shows all your asset, liability, and equity accounts plus their balances and account numbers. This is the default view. - Summary: This gives you a summary of your asset, liability, and equity accounts. This report will show you a listing of all the clients that owe you money and the time periods for how overdue accounts are. The periods are: current, 1-30, 31-60, 61-90, over 90 days, and Total. The As Of date can be changed to see Receivables at different points in time. If you have enabled Project Tracking on your Business Options page and you're tracking income and expenses by Project, the Filter by Project option will be available. Select a specific Project to see Receivables from that project only. If you want to get the breakdown of the amounts owing by any one customer, you can click on the customer name. This will take you to the customer’s profile section where you can see the complete transaction history with the customer. This report will show you a listing of all the suppliers that owe you money and the time periods for how overdue accounts are. The periods are: current, 1-30, 31-60, 61-90, over 90 days, and Total. 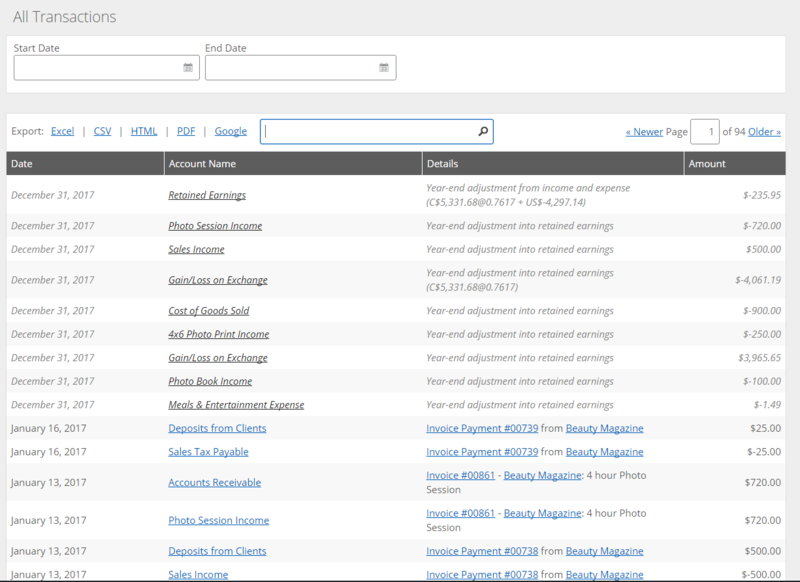 The As Of date can be changed to see the Accounts Payable at different points in time. If you have enabled Project Tracking on your Business Options page and you're tracking income and expenses by Project, the Filter by Project option will be available. 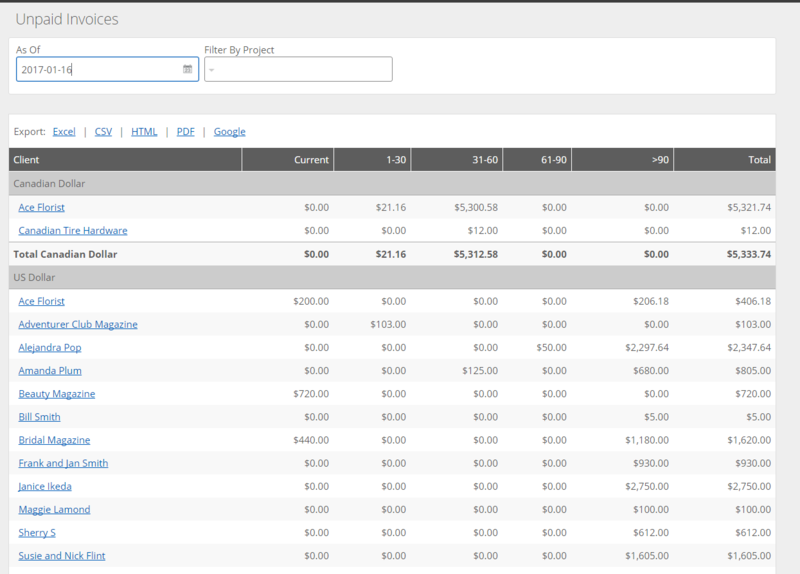 Select a specific Project to see Payables from that project only. If you want to get the breakdown of the amounts owing by any one supplier, you can click on the supplier name. 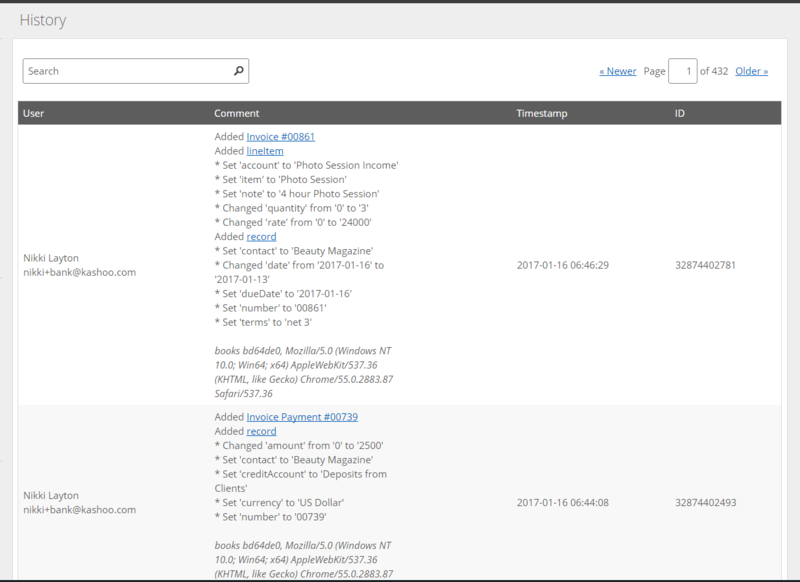 This will take you to the supplier's profile section where you can see the complete transaction history with the vendor. This report lists all your accounts and their balances, as of a certain period in time. Choose your report format: You can choose from the following time periods: Current, Prior 2 Years vs Current, Last 2 Quarters vs Current, Prior 2 Months vs Current. As Of: This selects the date you want to report from. So if you want know your Balance Sheet as of July 1, 2014, you would select Current from the Choose your Report format... field and July 1, 2014 for the As Of date field. This report will give you a complete log of every transaction entered into the system sorted by account. Start Date and End Date: You can choose the start and end date for the transactions you would like to see. Search: Use this box to search for specific transactions. For a full list of items you can search for in the Transactions page, please view the Using the Search Bar article. This report will give you a complete log of every transaction entered into the system sorted by date. This report acts as an audit trail. It lets you know who did what and when. Each transaction has a unique ID and timestamp. If a transaction was changed, you are able to see exactly what was changed and by whom. If a transaction had been deleted or modified incorrectly, you can use the change log page to find and correct it. A full list of items you can search for in the Activity page can be found in the Using the Search Bar article. You will notice that all of the reports (with the exception of the change log) can be exported to an Excel, CSV, HTML, or PDF file. This is quite useful if you need to hand this information off to your accountant or analyze the numbers in finer detail by using a spreadsheet. If you would like to better understand the reports and what the numbers mean, please go to the accounting basics area of our support site.